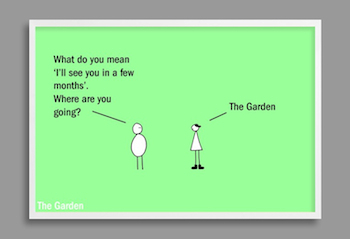 We are in the garden so that you don’t need to be. Our clients would like to come home from a long, busy day and be met with a calm, tidy yard and garden. We take care of their gardens throughout the seasons, beginning with the spring clean ups to closing the gardens for the winter months. Our staff of professional Master Gardeners is trained in proper maintenance techniques such as when and how to expertly prune trees and shrubs, cut-back and dead-head the perennials and annuals for continuous blooms, and water and fertilize when needed. All the while, we are monitoring the gardens to insure that the plants are healthy and colorful throughout the seasons for our client’s enjoyment. We practice sustainable, environmentally friendly gardening methods. We select and grow plants that are Mid-west hardy and resistant to pests and disease. We use organic materials, such as compost and mulch to improve soil structure and to keep weed seeds from germinating. We practice chemical-free techniques such as hand weeding and using organic insecticidal soaps on plants. Our staff is licensed with the state of Michigan to practice the Integrated Pest Management Program, using minimal and strategic use of chemicals only when necessary. We work with the most informed network of growers and local nurseries to make sure we choose the best products for our clients. From trees and shrubs to perennials and annuals, our goal is to create landscapes that flourish and thrive. We keep informed on the new varieties that have been trialed and tested as well as pest and deer-resistant plants. Our certified arborist is trained in the science of tree care, which includes proper pruning, planting and maintaining trees. We know that well cared for trees are attractive and can add considerable value to our client’s property. We can determine the type of pruning necessary to improve the shape of the tree by removing branches and thinning to increase light, and by removing branches that are weak, diseased or damaged that can pose a hazard. We continue our education and stay up to date in the latest techniques of Plant Health Care, a concept of preventative maintenance to keep trees and all plants in good health, fertilization and controlling insect and disease problems. 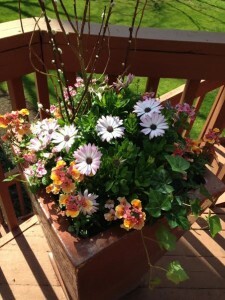 We create container plantings that offer four seasons of beautiful combinations for our client’s enjoyment. Containers allow us to bring much needed color to eye level in the early spring with frost hardy pansies, primrose and willow branches. Summer brings colorful continuous blooms, then changed for late season favorites in autumn and greens or conifers for the winter months. We combine our knowledge of annuals and perennials with our client’s preferences of color, keeping in mind placement, size and scale. Many of the perennials are moved from the containers into the gardens for a new home. As vendors of several manufactures of high quality containers, we are able to help our clients select the style and size of their choice.